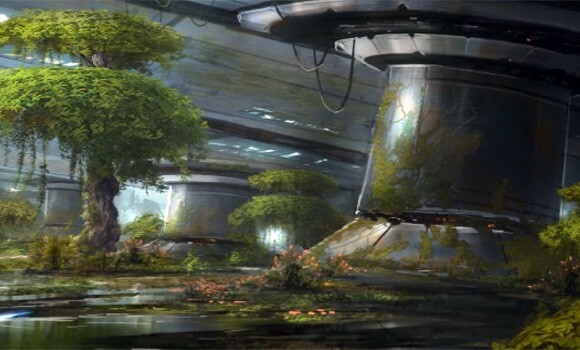 Taris was an urban planet in the Outer Rim Territories. The term Tarisian was used to describe people and products from the planet. The planet’s ecumenopolis quickly developed over a century of prosperity, and as a result the planet suffered from massive overpopulation. Once a galactic nexus, Taris’ importance declined with the introduction of improved trade routes, and the planet rapidly fell into decay. The remainder of the planet’s history was wrought with civil disorder and social unrest. As it turned to industry as a means of compensation for its economic troubles, its oceans became polluted, eliminating the planet’s main food source. Famine spread among the lower classes while the rich hoarded what few supplies remained. The resulting strife led to the Tarisian Civil War, the start of lasting prejudices between the Humanocentric Tarisian nobles and the largely alien underclass. The city became segmented, and the lower classes were banned from living in the upper levels of Taris. 23 – [Aim +2] X: -1513 Y:-272 Z:-255 First, go to (-1367, -208). Here you will find a ledge that beings against a wall. Follow the ledge and you will be brought to a halt by a walkway. Jump up and ignore this walkway and head to the wall to your left and keep following the ledge. Eventually you will end up on a thin metal platform. Below there is a long strip of bent metal that you need to jump down onto. This metal branches off two ways, take the left path (this side is much thinner than the right path), and jump onto the next area. At the edge of this structure there are pipes which you need to jump down to get on. Now, go right on the pipes and keep following. At the end of the pipe if you look down there is a ledge which you can drop to. Follow the ledge and look down to the area below with a broken roof opening, then jump down there. Go through the opening and the Datacron is at the edge of the tunnel. 24 – [Cunning +2] X:1048 Y:454 Z:453 First, go to (1182, 263) and head up the pipe. At the top of the pipe drop down to the left. Just follow the path and then drop down to the next area. Go down all the way to the edge. Be careful as there is a space between this jump, and drop down to the platform. Go straight a while until you see a gray walkway that you can jump onto. Follow the path and watch for jumps. Eventually you will see a large tree by a new gray path. Jump onto this path, follow it then jump up to the next area. Look left and you will see the ledge bent upward. Go near it and you will see another ledge you can go around to the right and you will see the Datacron. 25 – [Strength +2] X:1187 Y:-572 First, turn left near the Phased Instance and go up the hill. Note there should be Rakghouls and other enemies in your way. At the top of the hill curl left onto the flat broken structure. At the edge of the structure there is a pipe that you need to jump on and follow. Go straight up the ramps and the Datacron is at the top. 26 – [Willpower +2] X:-364 Y:-266 Enter the LOWER part of Dynamet General Hospital (Coords: -374, -134) and follow the path all the way until you reach the room with the stairs. Next go to the side of the RIGHT staircase and look for some crates. Jump over the crates and there is a small doorway to pass through. Follow the path all the way and you will find the Datacron. 27 – [Green Matrix Shard] X:1050 Y:1034 REQUIRES 2 PEOPLE – in the Abandoned Power Plant (SW of the east-most flight path) go East when you walk inside, you’ll see it above you on a pipe. Below it in the lower section of the area, there is a control console with a button. Standing on the platform behind the control panel where the button is will shoot a player into the rafters when the button is pressed. You cannot solo this datacron, period. 24 – [Aim +4] X:1180, Y: -168 Located in the Tularan Marsh, near the Swoop Raceway. 48 – [Endurance +3] X:-1513, Y: -255 First, go to (-1367, -208). Here you will find a ledge that begins against a wall. Follow the ledge and you will be brought to a halt by a walkway. Jump up and ignore this walkway and follow the wall to your left. Keep following the ledge until you reach the second grated metal platform. Below there is a long strip of bent metal, pointed towards a red pipe/tunnel, that you need to jump down onto. This metal branches off two ways, take the left path (this side is much thinner than the right path), and jump onto the rusty red broken pipe/tunnel. Along the north edge of this structure there is a silver pipe which you need to jump down to. Now, go right (east) on the pipes. Jump across the break in the pipe that you will soon come to. At the end of the pipe if you look down there is a ledge which you can drop to. Follow the ledge, jumping up a bit at the raised part and back down to the much narrower ledge on your right. Ahead and below you will see a platform with a broken roof opening. Jump down to the platform go through the opening and proceed along the big red pipe with the grey walkway atop it. 50 – [Willpower +4] X:444, Y: -772 You start at X: 365 Y: -218 and go up the broken pillar. Then you fall to the right to the wall edge, move under pillar you just were and jump to the next wall. Move over this new wall and then jump to another one to your left that leads to the another pillar. Be carefull — walls are broken, edges are twisted and there is a long way down. Once you reach the pillar go around it to the right, and then to the twisted beam. Then you need to jump down to the beam that will lead you to next pillar. You should not die from falling but better to restore HP before. 52 – [Cunning +4] X:-642, Y: -299 In the Brell Sediment find the entrance to the Abandoned Pirate Cave (around -747, 1168). Continue through the Cave to the Republic Mines. From there, use the Bulldozer (located at -643, 1543) to climb on to the scaffolding. From there, hop along the boxes and pipes lining the edge of the room until you reach the large stack of crates. The Datacron will be on a scaffolding below you.